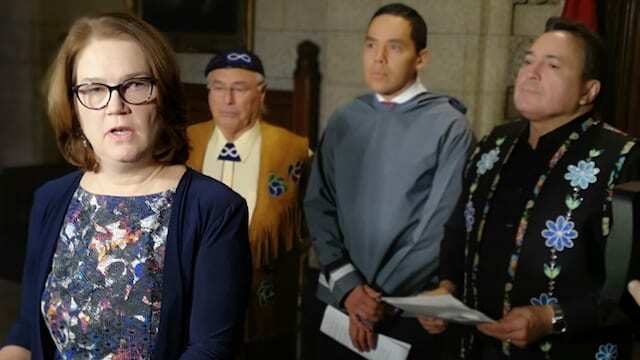 Indigenous Services Minister Jane Philpott says Canada, through forthcoming legislation co-developed with Inuit, Métis and First Nations, is aiming to put an end to “scooping children.” Justin Brake/APTN News. Canada will begin work with First Nations, Inuit and Métis to develop new child welfare legislation that Indigenous Services Minister Jane Philpott hopes will end the “scooping” of Indigenous children from their families. At an announcement on Parliament Hill Friday morning Philpott said the federal government will begin co-developing new legislation to address what it and others have called a “humanitarian crisis” in Canada. Upward of 40,000 Indigenous children are in state care in Canada – more than half of all children in care across the country. At the same time, Indigenous children make up just 7.7 per cent of the child population in Canada. “Every day in this country, on our watch, someone walks into a home, or perhaps a hospital room, where a First Nations or Inuit or Metis mother has given birth, and that baby, toddler or child is taken away from their family,” Philpott said in her opening remarks during the announcement. “They are taken away for the most part on the basis of something that is euphemistically called neglect, but in truth they are taken for reasons of economic poverty. Inadequate housing. Unresolved health issues,” she continued. She said the new legislation “marks a turning point” for Canada and Indigenous peoples. “For a century now, based on discriminatory policies of government, we have been taking children away from their families. It started with residential schools, it continued in the Sixties Scoop, and still today children are being taken from their families. Inuit Tapiriit Kanatami (ITK) President Natan Obed, Métis National Council President Clément Chartier and Assembly of First Nations National Chief Perry Bellegarde all welcomed the announcement. “It’s a new chapter for our children and families, a new chapter where we write the laws and policies that apply to our children,” Bellegarde said. Obed said the announcement marked “an immensely proud moment” for him as a political leader. “From the time that there has been Canada and the assertion of control over Inuit, there has been a disrespect for Inuit children’s rights,” he said. 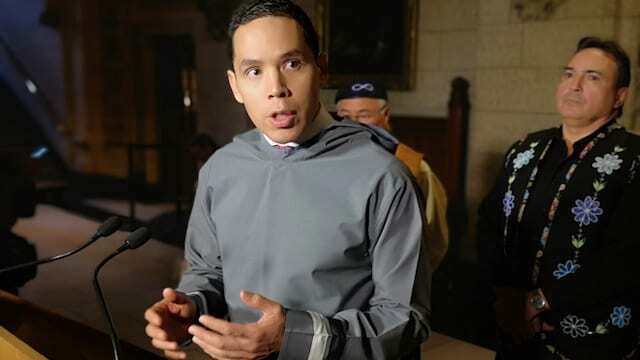 “There has been a disrespect for Inuit children’s rights” by Canada, ITK President Natan Obed said Friday. “This is ending.” Justin Brake/APTN News. Obed added the legislative changes aren’t just owed to Indigenous peoples and children, but also “an obligation that Canada has to itself. “It is a measuring stick on how Canada is as a Nation within the world,” he said. Chartier said the coming legislation, which will be introduced in early 2019, “is big,” and will benefit his people the most. “For well over 100 years we have been ignored and marginalized, our rights repressed, our rights denied, our existence as a Nation of people denied,” he said. 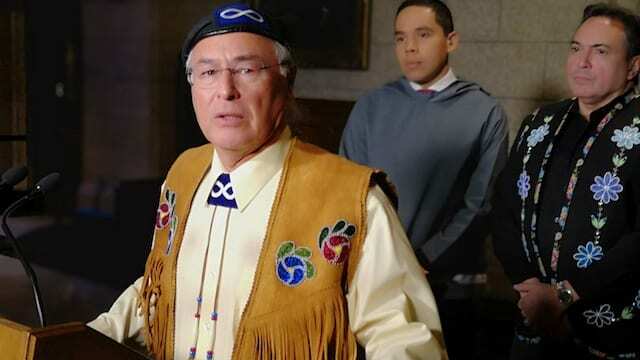 Chartier said he would like to see this legislation ushered in alongside the Indigenous rights framework the government is also working on in order to expedite the full recognition and implementation of Indigenous rights belonging to Métis people. Philpott said she has met with provincial and territorial Indigenous Relations or child and family services ministers, and that the provinces “are in various states of enthusiasm about what this will look like. Philpott said most provinces have recently undertaken reviews of their own legislation and policies on Indigenous child welfare, and that she hopes the feds and Indigenous leaders can work with the provinces “to recognize the different circumstances” that exist in each jurisdiction. A news release from the government Friday morning explained the legislation is the result of 65 consultations with upward of 2,000 individuals from Indigenous governments, organizations, and grassroots groups, totalling nearly 2,000 individuals. 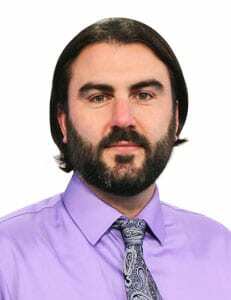 Métis National Council President Clément Chartier said he would like to see the legislation developed and implemented quickly for the benefit of his people. Justin Brake/APTN News. The legislation will “affirm inherent Aboriginal and Treaty rights as well as affirm principles consistent with the Calls to Action of the Truth and Reconciliation Commission, the United Nations Declaration on the Rights of Indigenous Peoples, and the United Nations Convention on the Rights of the Child,” the release says. Canada was also compelled by a 2016 Canadian Human Rights Tribunal ruling that the government’s First Nations Child and Family Services Program was discriminatory. Earlier this year an emergency meeting on child welfare was held with representatives from Indigenous governments and organizations, and grassroots people, from which Canada announced a plan that included the legislation. “A pillar of the legislation will be the right to self-determination of Indigenous peoples to freely determine their laws, policies and practices in relation to Indigenous child and family services,” Friday’s news release reads. How about Healing funds for those who have been chased away from reserves to keep their family safe from pedophiles and opioid addictions and give them a better chance to not go down that road. Sad but reality is that our People’s need healing, takes 7 generations to heal.